Nadaje Broadcasting will be at BVE in London next month to highlight its live streaming solutions. Ahead of BVE, Nadaje Broadcasting has released the first edition of nMagazine, a quarterly radio and TV live streaming industry update. Taking centre stage at BVE will be the Video Streams platform. This solution offers a flexible approach to streaming events with the world’s leading CDN coverage, individual, configurable web-player or a page within Nadaje.com with a password as an additional feature. Video Streams offers a Pay-Per-View option with online payments by TPay.com and live-chat to interact with your viewers in real time. Video Streams is available as a monthly subscription or as a one-time service, ideal for use in a number of verticals, including live streaming cultural, sporting and corporate events, as well as in the education and government sectors. Also at the show, Nadaje Broadcasting will present Radio Hosting, a service conceived for professional radio stations. Thanks to an international network of servers the company guarantees a stable connection and with our strong technical knowledge we help radio stations enjoy a flawless streaming experience. Radio Hosting is currently used by more than 200 radio stations across Europe. The service is available under a monthly subscription and comes with a web-payer for a customer website. Finally, Instore – an audio service that offers mass broadcast to retail and hotels – will also be in London. The service enables broadcasters to deliver different audio content to different locations from a single cloud music database. The service includes a Customer Web Panel to manage music, jingles and advertisements online from any location and monitor connected devices. 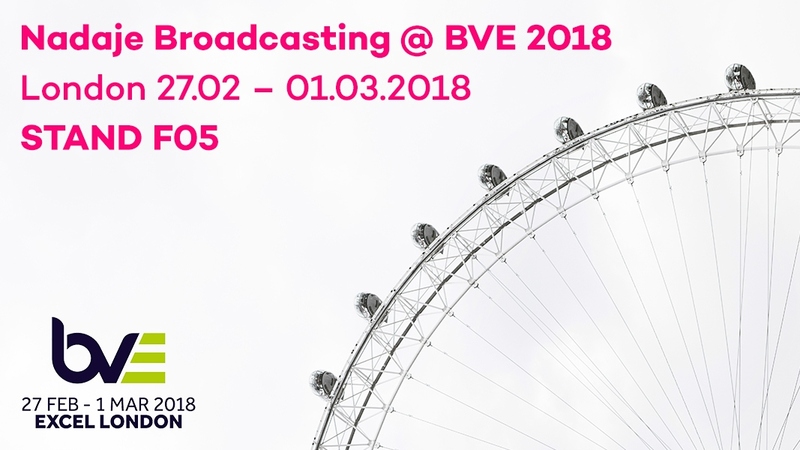 Visit stand F05 at BVE to find out more and to get details on free test accounts and trial periods so you can discover the power of Nadaje Broadcasting’s software platforms. Take a look at the BVE Show Preview to help you plan your trip to the show. Make an appointment via the BVE meeting zone.